1 tbsp olive oil. Season and mix well. 2	In a separate bowl put the juice of the second lemon with the remaining 2 tbsp of the oil, mustard and seasoning. Whisk and set aside. 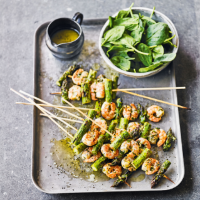 3	Thread the asparagus and prawns onto the skewers, distributing them evenly. Heat the barbecue (or griddle/grill). When medium hot cook the skewers for 2-3 minutes each side, until the prawns turn pink and are cooked through. Put the spinach leaves in a small bowl to serve (as above), or scatter leaves over a platter and set the skewers on top. Drizzle over some of the dressing and serve with the remaining dressing on the side. You don’t want the coals too hot for this recipe, so make sure they are evenly grey before you start cooking.